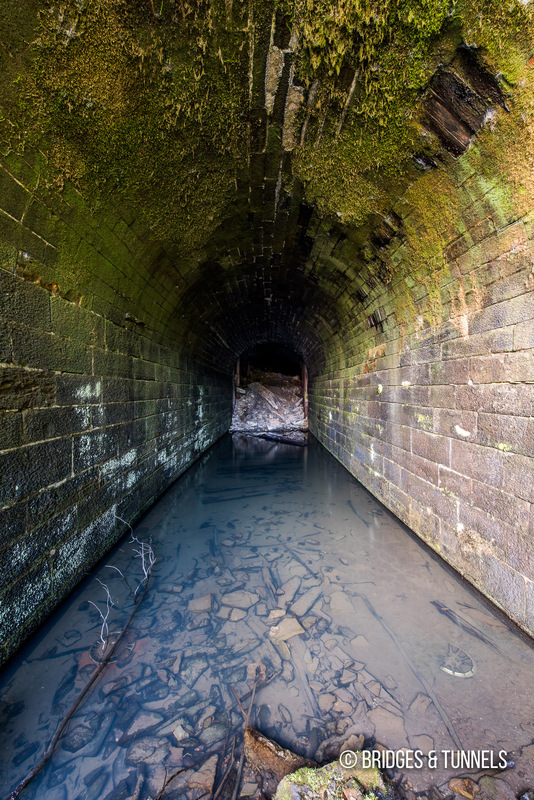 The Oil City Tunnel is an abandoned tunnel that was operated by the Jamestown & Franklin Railroad (J&F) in Oil City, Pennsylvania. Completed in 1870, the tunnel was abandoned by the New York Central (NYC) in 1967. In 1862, George A. Bittenbender, William Gibson, David Hadley, Henry C. Hickok, A.W. Raymond, William Lawrence Scott and John P. Vincent sought a charter for a shortline railroad in northwest Pennsylvania. 1 The goal was to connect the Erie & Pittsburgh Railroad (E&P) in Jamestown with the oil fields about 25 miles to the east and southeast. The Jamestown & Franklin Railroad (J&F) was chartered on April 5, 1862 1 2 to build a line from Jamestown to Oil City. The charter was amended on March 9, 1863 to allow the company to purchase up to 5,000 acres of land adjacent to the railroad for mineral exploration. Flush with funds, construction began on the J&F in Jamestown in April 1864. 4 By August 1865, the mainline reached 21 miles to Stoneboro. The J&F then leased trackage rights on the E&P and began running trains between Jamestown and Girard. 5 Trains began running into Franklin on June 27, 1867. Work began shortly after on the Franklin to Oil City segment, reaching Oil City on May 24, 1870. 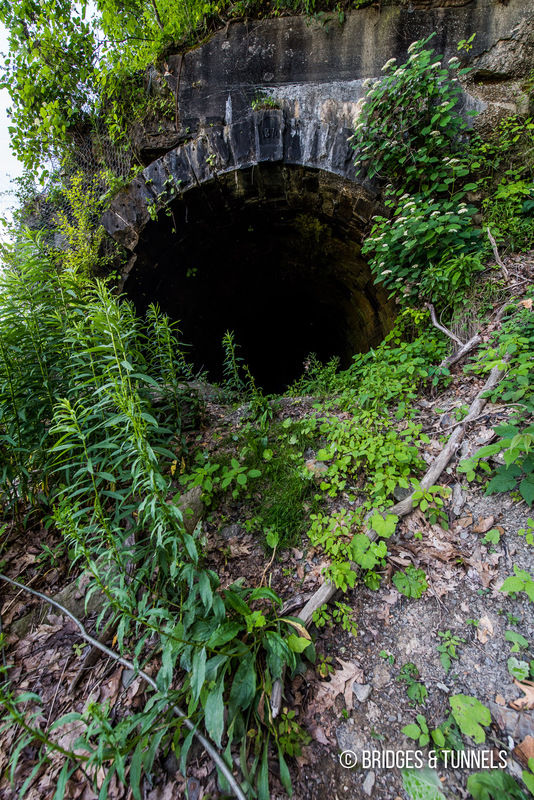 1 Failing to secure right-of-way in front of Hogback Hill in Oil City, the J&F was forced to construct a 909-foot tunnel that cost $100,000 to complete. 8 The entrances to the tunnel was built with cut stone masonry but the inner section was rough and unlined. 5.21 mile Central Trunk Railroad which had constructed a connecting road in 1870. 56-mile Franklin & Clearfield Railroad, incorporated on June 19, 1902. It built 56 miles from Franklin to Rose Siding, a point on the PRR’s Allegheny Valley Line near Brookville by February 1909. 3.7 mile Jackson Coal Railroad, incorporated in 1883 with the intention to build between Stoneboro southward. It formed the Jamestown, Franklin & Clearfield Railroad (JF&C). 10 The JF&C was acquired by the NYC on January 1, 1915, 10 losing its identity on April 17. becoming the Franklin Division of the NYC. It was consolidated into the NYC’s Erie Division and operated as their Oil City Branch in the 1930’s. The NYC, like many railroads in the United States, declined after World War II. Problems that interfered with the railroad before the war, such as over-regulation by the Interstate Commerce Commission, along with competition from automobiles, trucks and seaways, caused the NYC traffic to plummet in the 1950’s and 1960’s. On February 10, 1965, the NYC began deliberations to dismantle its route between Reno and the north side of Oil City. 9 It would include the abandonment of its tunnel, 8 which needed $50,000 to $100,000 in repairs. 9 The NYC followed the north side of the Allegheny River through the tunnel, and connected with the Pennsylvania Railroad (PRR) north of the White Bridge. Between Franklin and Reno, the NYC and the Erie operated on one shared track. The NYC had no business with any larger industries in the Oil City area, providing only switching facilities with the Erie and PRR. 9 It did serve the Continental Can Company and Wolf’s Head Oil Refining Corporation near Reno, but those companies were able to be served by the Erie. The NYC was granted permission to abandon its route between Reno and the north side of Oil City in late 1967. Babcock, Charles A. Venango County, Pennsylvania: Her Pioneers and People, Embracing a General History of the County. Vol. 1, Chicago: J.H. Beers, 1919, p. 64. Ohio Commissioner of Railroads and Telegraphs, 1881, p. 919-920. Sanderson, Thomas W. 20th Century History of Youngstown and Mahoning County, Ohio, and Representative Citizens, Chicago, Biographical, 1907, p. 236. “Fortieth Annual Report, Lake Shore & Southern Michigan Railway Company: For the Year Ended December 21, 1909.” Railway Age Gazette, 18 Mar. 1910, pp. 759-760. Sanderson, Thomas W. 20th Century History of Youngstown and Mahoning County, Ohio, and Representative Citizens, Chicago, Biographical, 1907, p. 239-240. Benton, Sarah Ann. Franklin, Charleston: Arcadia, p. 73. “Railroad Tunnel is Getting New Timber.” Oil City Derrick, 9 Jan. 1923, p. 16. “Ways to Use NYC Tunnel are Studied.” Oil City Derrick, 23 Nov. 1965, p. 9. “Reno-Oil City Railroad May Be Abandoned.” Oil City Derrick, 10 Feb. 1965, p. 1. “Transportation, the NYC’s Link West.” Progress [Clearfield], 12 Oct. 1967, p. 1.